Ethics - $1025 for six c.e.u.’s. Online prepayment is available through Paypal. Call to register 713-553-9600. This course will include handouts from all major massage organizations, specific issues in Texas law, as well as general business ethics. Be prepared to discuss and suggest how to solve some of the issues which will be raised in the teaching experience. Qualifications to teach: Coursework: 6 hours AMTA classes; 15 hours Ethics and Business Classes, Business Law. In preparing for the course teaching additional readings on Business Ethics and internet study has been made. 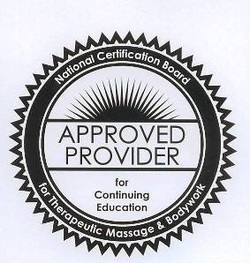 Margo Benge is approved by the National Certification Board for Therapeutic Massage and Bodywork (NCBTMB) as a continuing education Approved Provider.